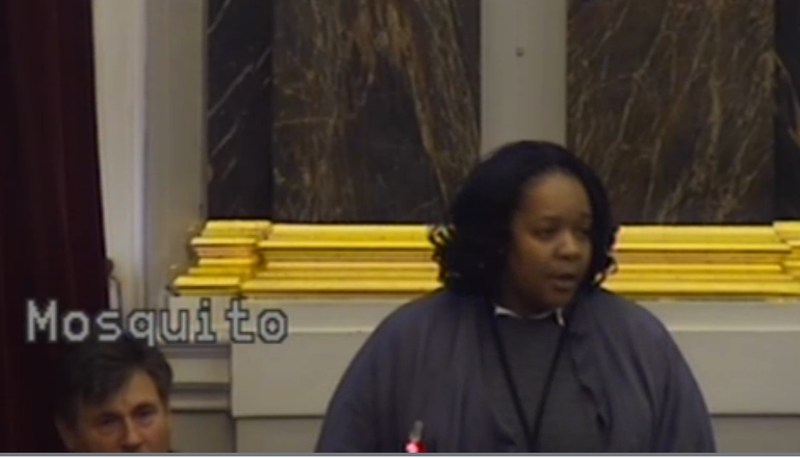 Cllr Yvonne Mosquito, Chair of Ladywood District Committee, failing to explain why Ladywood is making disproportionate cuts to local libraries compared to other Districts. Yesterday’s Council meeting saw the Tory group get off the wheely bin bandwagon to assume the role of public ‘defenders’ of the city’s community libraries. The opposition staged two interventions at the meeting including moving a motion to ‘protect’ suburban libraries and secondly by posing a challenging question to the Chair of the Ladywood District Committee. Cllr Mosquito was asked by the leader of the Liberal Democrat Group, Cllr Hunt, why Ladywood was the subject of disproportionate library cuts including the closure of two libraries which was not the case in other districts. Cllr Mosquito failed to explain why there would be heavier library cuts in the District than elsewhere, stating instead that residents would be encouraged to take advantage of multi-million pound LoB which is situated in Ladywood. Also claiming that people living in Ladywood would continue to be able to access to a library within one mile of where they lived. Cllr Robert Alden, on behalf of the Conservative Group, later moved a motion which recognised local libraries as a focus for the community and that the Library of Birmingham should not be seen as a replacement for the Community libraries. Cllr Alden questioned why Spring Hill library had been earmarked for closure when it had seen an increase in footfall and was evidently a thriving local library. He claimed that cuts to library services disproportionately affected the most deprived communities who were more reliant on using the resources provided by local libraries. Alden cited the public questions asked by supporters of the library campaign at previous Council meeting as evidence of the level of public concern. The punch line from Cllr John Lines, in seconding the motion, was that the Tories built libraries in the city while Labour closed them. Referring to the Shard in Shard End and Library of Birmingham which were commissioned under the previous administration. The response of the ruling Labour Group was to move an amendment to delete the second paragraph of the motion to remove the commitment to protect local libraries. The Labour defence of its cuts and closure of library services was threefold. Cllr Ward, concentrated his fire on the Council’s funding settlement for 2014-15 and of the cuts being imposed on city by the national Con-Dem Government. Pean’s of praise were heaped on the ‘world class’ Library of Birmingham and the opportunities it offers to the residents of Ladywood, upon which basis they wouldn’t miss their neighbourhood libraries. Cllr Hughes argued, without providing any evidence, that changes in technology required a reduced but modernised library services. The Labour Group moved the motion to a vote and their amendment was accepted. If the intention of the opposition was to embarrass the ruling Labour Group on their record of ‘protecting the most vulnerable’ then they succeeded. The library cuts in Ladywood are disproportionate and affect a community with greater literacy needs than most. These are Labour cuts made by a 100% Labour run District. Not once did Labour members refute the opposition claim that Spring Hill Library was a successful local library with rising footfall. As one opposition Councillor warned the proposed closure of Spring Hill had not been properly thought through. The Conservative position is far from honest. Wylde Green library has been identified for closure by the Conservative run District Committee in Sutton Coldfield, with a commitment to explore an option to move other libraries in the District into a Trust. It should also be remembered that the previous local Con-Dem administration also implemented the ‘Future Operating Model’ in the Community Library service, which involved the libraries budget being cut by 28% and which has led to staffing being reduced by a third. There is also the small fact that over 300 public libraries have been closed nationally in the last three years as a result of spending cuts imposed by the Con-Dem Government and by the deliberate inaction of the responsible Tory Secretary of State, Ed Vaizey. In this context, yesterday’s manoeuvring by the Tory Group in championing Birmingham’s libraries can be seen to be nothing but unprincipled opportunism. On the 22nd May 2014 the local elections take place, to stop Public Libraries being used as a political football by all the pro-austerity parties we call on all candidates standing for election in May to pledge to oppose all current and future cuts to library services and to keep all our existing Community libraries open and publicly run. ← Hands off Spring Hill Library – Our Heritage! Our Future! Some of us have worked so hard to get people into libraries and the ‘privileged’ minority want to close them. When I started teaching in 1975 I took 6 children every monday to Central Library after school. We had individual membership, class loan and school loan. I helped dust off the book s in Aston Library and even set up an Art class in there so grandparents could take books for their grandchildren. Since the introduction of computers there’s been an increase in the use of libraries but not everyone can afford to buy lots of books. The Library is not just a place to read and borrow books. Homeless, women suffering domestic violence, elderly, lonely have a warm safe space to go for a few hours a week. Instead of closing we should have all libraries opened every day.